Canary Promotion just wrapped up our publicity campaign for Museum Without Walls: AUDIO, a public art project by the Fairmount Park Art Association. One of our final pieces of press coverage secured for the project includes an in-depth feature by Associated Press writer Joann Loviglio, a story which was first published last week and continues to make it’s way across the country. 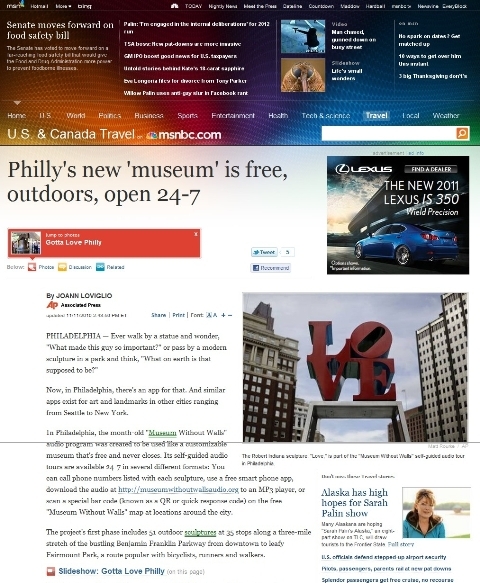 The AP story - Philly’s New ‘Museum’ Is Free, Outdoors, Open 24-7 - is great exposure for Museum Without Walls and the city, once again positioning Philadelphia as a destination for public art and other cultural attractions. To date, the wide-reaching AP story has popped up in The Seattle Times, ABCNEWS.com, Yahoo! News, MSNBC.com, The Huffington Post, Nola.com, Stamford Advocate, The Canadian Press, Marin Independent Journal, The Philadelphia Tribune, METRO, Greenwich Time, Desert News, The Republic, The Pioneer Press, and PhillyBurbs.com, among others! Museum Without Walls: AUDIO is a wonderful addition to our city and we look forward to seeing how the project expands and develops overtime. If you have not had a chance to experience the program, we encourage you to do so! Visit museumwithoutwallsaudio.org to learn more, download the free mobile app, pick up an official guide from the Visitor’s Center, or better yet, stop and take a close look at the next sculpture you see on the Parkway or Kelly Drive and look for the cell phone call-in instructions located on the sign in front of the artwork. For more on Canary’s publicity campaign for the Museum Without Walls: AUDIO launch, see our electronic press kit for the project at canarypromo.com/museumwithoutwalls.